having various things we need to get taken care of in bangkok, mine including a visa extension, i bought 3 tickets on bangkok airways from ko samui to bangkok for otto, whit, and i. we awoke bleary-eyed at 5am and headed for the airport. our plane was rickety and hot, and we arrived in bangkok in rather foul moods. to my surprise a young thai girl met us with a baby in her arms- she is soon revealed to be whit's 'mia noi' (minor wife), and the baby his illegitimate son. thailand will never cease to astound me. we head in a taxi towards banglamphu- shocked by the loudness and pollution of this sudden civilization. the taxi driver speeds too fast and tells tales of farangs he has robbed. it is the king's birthday again- he is 77 years old. the city is decked out in lights and shrines. fireworks are shooting off, everyone is singing. ot gets a call from his mother- she is in bangkok for one day, with his father. 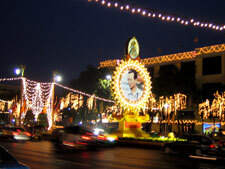 as the king's birthday is also father's day, he pleads with me to go visit them. i accept very reluctantly, i have never met his mother but i hate the pressure of family gatherings. we take a 300 baht cab ride to the outskirts of bangkok to his aunt's suburban plastic neighborhood. ot's nieces and nephews greet us smiling, jumping all over 'loueng ot' and presenting us with candles. there is a ceremony in a small grassy area dedicated to the king. i feel awkward when everyone bows to pray. we put our candles in a big flowerpot under the picture of the king. i distract myself with a puppy who is frolicking underfoot. ot's smiling aunt leads me into her house and dumps a basket full of pictures on my lap. i am the center of attention. everyone stares, smiles, takes pictures. ot's mother says i have a great body and if i don't be careful someone might take advantage of that. ot shrugs and pats me on the knee. i blush. ot carries a strand of jasmine from the kitchen and bows before his father. they exchange blessings for father's day. ot hugs him warmly and his father beams happily. hours later, full of spicy salad and friend pork and overwhelmed by the family atmosphere, i beg ot to call a taxi and we escape. we arrive at his house very late, and i am asleep halfway up the stairs. ot croons to me and rubs my head as i sleep.